Singing Emptiness: Seagull Books, 166 pages, Rs395; Rs495 for the hardcover. 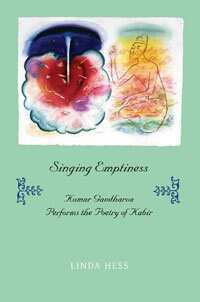 Among the new books that I decided to treat myself to recently is this neat little 166-page book authored by Linda Hess titled Singing Emptiness: Kumar Gandharva Performs the Poetry of Kabir. Hess is an acclaimed scholar who has written extensively on Bhakti poetry and the saint poets of India, including Kabir and Tulsidas. Kumar Gandharva, maverick vocalist and composer, whose vision and genius left an indelible impact on the world of Indian music, was renowned for his unique and insightful interpretation of Bhakti poetry, and Kabir verses in particular. Hess anchors Singing Emptiness in Kumar Gandharva’s performance of Kabir, quoting extensively from interviews, papers and other authoritative works on both Kabir and Kumar Gandharva. In recent years, there has been a spate of books on Indian musicians by Indian authors, many of them biographies written by adoring family members and disciples; autobiographies and monographs, often replete with adjectival outpourings of gushing sentimentality. In some cases, the authors even forget that the book they meant to write was about a great musician, a guru whose contribution to the world of Indian music is unparalleled. Instead, they write a book that has more about the chela (disciple) than the guru. In its attempt to concentrate on the music more than the persona of the singer, Singing Emptiness is a very welcome change. Admirers and followers of Kumar Gandharva are bound to have some of these tracks in their music collection and Hess refers to the earlier albums to make observations both on song texts and their melodic interpretation. The only change I could have asked for is perhaps for the publishers to have packed the CD a little more carefully. The CD sits in a really tight, thin clear plastic sleeve glued to the inside of the back cover, and as a result removing the CD from the sleeve without scratching it is well-nigh impossible. An invaluable part of the book is the selection of 30 nirgun verses translated into English by Hess, and these include verses that carry what she describes as “Kabir’s signature line" as well as other texts that assign authorship to others or remain devoid of any signature line at all. Through the book, Hess refers generously to, and quotes from, a variety of sources—U.R. Ananthamurthy’s poem written after he heard the singer at a concert in 1989, essays and writings by Ashok Vajpeyi who shared a close bond with Kumar Gandharva, and interviews with the singer’s family, including his wife Vasundhara Komkali, who almost invariably provided vocal support for most of his concerts and recordings. My personal favourite, though, is an extract from painter Gulammohammed Sheikh’s comments from a 2001 interview where he talks of his own engagement with Kabir’s writings leading to a series of works titled Kahat Kabir and on his response to Kumar Gandharva’s rendering of Kabir. But I will say no more because this was not meant to be a book review. I do not, repeat, do not and will not review books on music any longer. Don’t ask why but I’ll tell you some day! Treat this as a sort of extended version of my Twitter status; a more than 140-character tweet to draw your attention to a book that I read and have added to my personal library, nothing more.